Installing other servers and services in Fedora can be a headache, especially without the right tools. There is all the documentation you have to read and all the commands you have to put in via the terminal. all this can be made easier with a few tools. 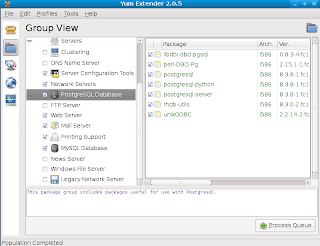 If you are intending to use Apache2, MySQL and PostgreSQL, you can install them with the appropriate yum commands. Better yet, you can install yumex (To install, type the command yum install yumex as root in the terminal) which is a GUI for yum and gives a simple and fast interface to search, configure, install and update packages. When installing MySQL and PostgreSQL, make sure that mysql, mysql-server , postgresql, postgresql-server are installed. Several people tend to forget installing mysql-server and get errors when trying to run mysql. Installing Apache2, MySQL and PostgreSQL is the easy part, configuring them can be quite hectic. 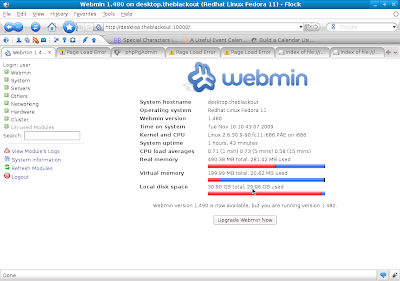 To make configuring them easier, I recommend that you download and install webmin (http://www.webmin.com). To log in to webmin, use your computer's root username and password. Webmin is accessed via your browser by accessing your localhost via port 10000, "http://localhost:10000". 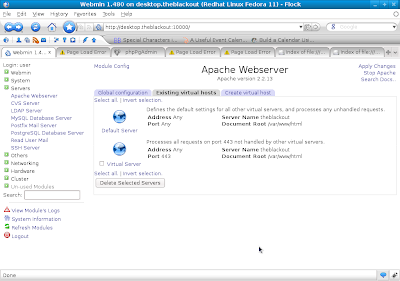 To configure Apache on webmin, go to the "servers" section on the left tab and select "Apache Webserver". 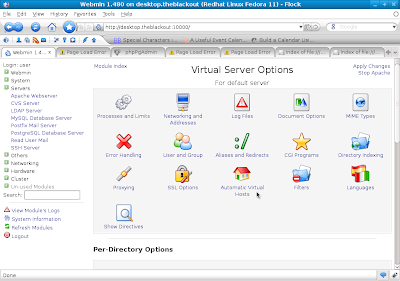 This gives you an interface for your hosts, inclusive of your virtual servers. From the interface, you can start and stop the apache server on your system. Clicking on a host gives you an interface to configure aliases, hosts, SSL options amongst other configurations. Once you have installed MySQL, you can initialize it and create users via the MySQL module in Webmin. 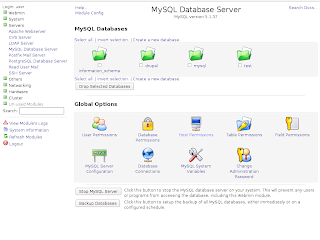 The MySQL module is accessible by clicking on "servers" on the left tab and selecting "MySQL Database Server" Option. From this module, you can start and stop the MySQL server, create, delete and manage users, create, manage and delete tables. When creating your first MySQL user, you should be careful enough to select all the permissions(under the tab labelled ' Permissions for new users') (By default it only selects the "select table" permission). Failure to do this will result in you having a user that cannot do anything including create tables. To remedy this, you will have to reset the privileges table( I will post on the procedure later). As for creating and managing tables, I prefer phpmyadmin, which is a browser(web)based interface for the MySQL server. To install it, use the command "yum install phpmyadmin". To access it, go to your browser and use the adress "http://localhost/phpmyadmin". Log in with the usernames and password that you created in webmin above. PostgreSQL doesn't have a lot to configure, but it can take hours or even days to figure your way around the configuration. Similar to MySQL, webmin has a module for configuring PostgreSQL. The module is under servers on the left tab again. With this module, you can initialize PostgreSQL (If you are running it for the first time), create and manage users, tables and access permissions. To access PostgreSQL from other applications, you will need to change the host permission configurations. Under the PostgreSQL module, select that "Allowed Hosts" icon. From the interface that comes up, change the Authentication mode for the local connection to use "MD5 encrypted password". you can then create a user (other than the default postgres user) from the module. To manage PostgreSQL, you can install the phpPgAdmin application ( "yum install phpPgAdmin"). To access phpPgAdmin, type in the dress "http://localhost/phpPgAdmin" in your browser (Note the capitalization, phpPgAdmin and phppgadmin are different on Linux). Log in with the username and password you created in the PostgreSQL webmin module. Have fun with your Fedora Linux Apache MySQL PostgreSQL PHP (Fedora LAMPP) server . To configure Drupal in fedora, go here.